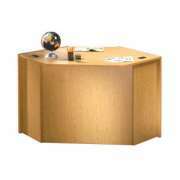 Greet patrons in style with Hertz Furniture&apos;s functional and sophisticated circulation desks. 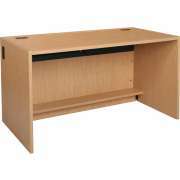 What kind of features should you look for in a library desk? User-friendly features and attractive design will invite students, teachers and visitors to enjoy your excellent book collection. Great library furniture facilitates a relaxing and enjoyable study experience that will keep visitors coming back for more. Our selection of library circulation counters includes suggested arrangements and modular designs that let you determine your ideal configuration. It features high-quality pieces that will last through many years of research projects and study sessions. 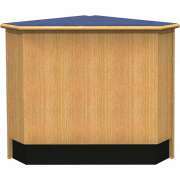 Circulation desks should be convenient for librarians and attractive to patrons. A great design can make everyone&apos;s experience more enjoyable. The right features will help a school library run more efficiently by expediting check out, returns and book requests. This will make the whole process more enjoyable for all parties involved. Excellent service, happy patrons and satisfied employees make an enjoyable study experience that encourages further learning. 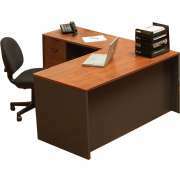 What library desk configuration do I need? 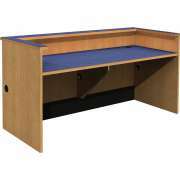 Hertz Furniture offers a number of prearranged typical library desk configurations. 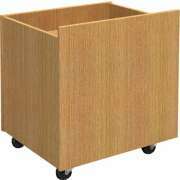 These can be used as a reference for what should generally be included in your desk design, or ordered as a complete package. 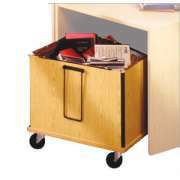 They include everything that is needed in a typical arrangement including storage and filing space as well as computer-friendly pieces. With appropriate arrangements as a reference point, you can be sure that you won&apos;t overlook any important components. If you decide that you prefer a custom design, our modular circulation desk pieces offer great choices and configuration possibilities. 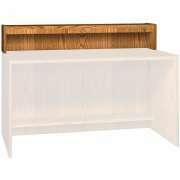 We have an exclusive selection of Russwood Library Furniture lines that can accommodate budgets both big and small. Designs range from basic materials to more elegant and intricate detailing. Circulation desks can be coordinated with full library furniture collections that include study carrels, bookshelves, computer tables and more. Looking for something vibrant and fun? Educational Edge library furniture features bright accents for a more colorful study space. 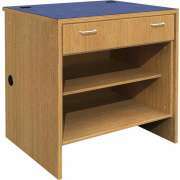 Which desk surface material is best for a library circulation desk? Work surface material is a key determinant of durability. 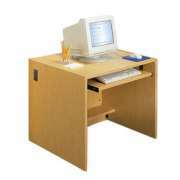 A tough desktop will look great for many years, leaving the sleek professional impression that is worthy of your space. 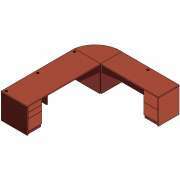 To keep library circulation desks work surfaces clutter-free, wire-management grommets are a must-have. They move cables out of the way and make it easy to route wires to a power source without creating tripping hazards and unsightly inconveniences. Another important feature for anyone with a desktop computer is a pull-out keyboard tray. Having a built-in book return in the reference desk is convenient for both patrons and librarians. Borrowed books can easily be returned as people enter the library, and librarians can then access these books right away to record returns and holds. 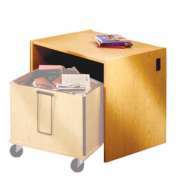 Our book returns include a mobile book truck which conveniently wheels out from under the desk for reshelving. Shelves and drawers in the library circulation desk are key components of an organized library. 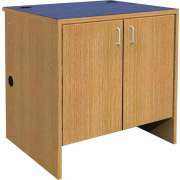 Pedestals offer both box and file drawers so office supplies and important documents have a designated place that is readily-accessible. 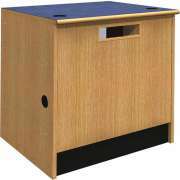 Mobile pedestals are especially flexible because they can be placed in any open space under the work surface, and rolled out when their contents are needed. How can I create a nice space for librarians to work in? Because the circulation desk sits in an open space, it is helpful to find ways to make the librarian&apos;s work area more private. 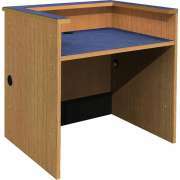 A patron desk with a recessed work surface keeps private forms and work out of view. 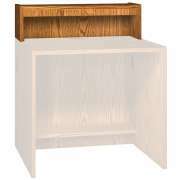 This creates an appropriate space for a computer monitor, or can serve as a convenient writing surface with a more personalized feel. 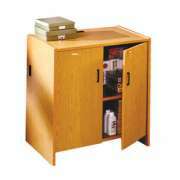 Open shelf units in a library information desk create a more flexible storage space. They are perfect for extra poster paper, or books that are not of a typical size. 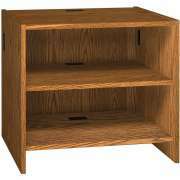 Many of these units feature adjustable shelves, which enable you to store virtually anything from hole punchers to small electronics. Hertz Furniture&apos;s selection of circulation desks makes it easy to design a functional and attractive school library on any budget. Our high-quality library furniture is designed to facilitate a more enjoyable experience for everyone from students to librarians to teachers. If you need help determining the best library desk configuration for your space, don&apos;t hesitate to contact the Hertz Design Center for a free consultation and project planning advice.